With Tia gone, and no real commitments yesterday, I decided to get some things done around the house. Lots to do before winter hits and a shortage of time with lots of travel. 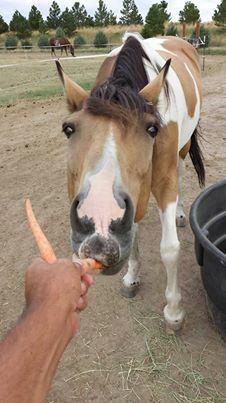 I started by feeding horses. I assumed Tia had the kids lined up, but with everyone asleep at 9am and me up, I decided to just do it. All the bales were stacked, so I needed to tractor one down before I could get going. That done, I had my first chance with the new feeders. They worked well and were fairly easy to load. Glad I built those, and it verified my plan to build more. Next I tackled the dog area. It’s small, and while I need to expand it, I settled for cutting the grass, some of which was high, and picking up piles. It looks better, and I need to make sure the kids or one of us clean it out more regularly. With that done, I decided to get the gate working next. Kyle had come out and said we were supposed to let horses loose while I was feeding, but then the gate looses power, it looses it’s settings. So I grabbed the manual and headed out to reprogram it. It took longer than expected, but I got it done. I need a post on how to do it, so I can easily find it. At this point I needed a break. I made some lunch, and watched a few series of football before heading to town. I planned on building another feeder, and decided to try a new design. With a rough idea, I grabbed some supplies, some groceries, and headed home. I worked on my feeder in the afternoon, dodging mosquitos and finally giving up around 6pm. It’s mostly, but not completely done. Heaver with 2x12s, but I think this might last longer. I’ll build a few more in this style and then decide in the spring which is better. I have orders from some of Tia’s friends for these, so I might enlist the boys to help build a few. As I was finishing, Kendall asked for some homework help. I told her I’d be in soon, but would she walk the dogs and get the mail. She agreed, and looked cute on her return. A good day, and I even got to watch the Broncos game, albeit a few hours late. Kendall had an away game today, and I decided to go see. Ive missed the other 4, 3 too far away, and this week because Kendall was sick. This was the only one, and I headed down. The experience is different, I guess because it's a new place. I enjoyed it, watching Kendall play well for the first two games. As the third started, I had to leave to get Delaney. They won one and lost one, but Kendall played well in both of the two. It's neat seeing her play, and I'm somewhat sad that the season will finish on Monday. However it's been fun and I look forward to her club season over the winter. I got this from Kendall last night. He’s got 20, needing 21 for Eagle, but he’s short 4 more required ones. Good news: he’ll almost have enough for a palm. Finally, the FAA may change their rules, according to Ars Technica. It’s about time this got changed as it’s been a ridiculous rule. I’ve heard lots of pilots and various people express concern over large concentrations of devices emitting signals. If that were the case, you’d have seen lots of terrorists or bored kids keeping all their devices on to see what happened. This is an overreaction from the FAA, because they were concerned and didn’t have data. Fine, but then gather data, don’t just keep rules because you don’t understand things. Do some research and then only limit things that are truly dangerous. Another great example of how the government has infringed on our rights for no particular reason. I'm not sure I've done this in 20 years. 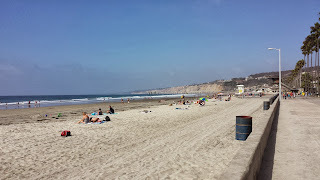 I got up this morning, and after working for an hour, drove down to La Jolla, to the Coggins Aquatic Complex for a swim. I'd missed it yesterday when I drove by because it's attached to La Jolla High School. As in a stairway to a side gate from inside the high school fence. As I walked in, paid, and was heading to the locker room, kids were walking to different buildings between classes and a class of them were coming into the pool area for PE. Surely I missed out by not going to school in CA. It looks like Grease or other movies, much different than my high schools. It was quiet, just 1 other person lap swimming in the big pool, so I changed and jumped in. I worked a pyramid, getting 2100yds done in about 45minutes. Not too hard, but good work and I felt great. Outdoors, 72F air, 80F water, slightly salty, a great morning. I think that last time I did this was when I lived here in 91/92, and there was an outdoor pool in Oceanside I'd go to and swim in the mornings sometimes. I miss that, though not sure I'd want to live here again. It's always neat to go back to a place I lived in the past. Today I flew to San Diego. Not thrilled to be starting a bunch of travel across the next month, but it was nice to get back to San Diego. A slightly delayed flight and I was starving when I landed. I grabbed a car and left the airport, skipping the restaurants inside to drive out to Pacific Beach. I used to run past this lifeguard station all the time when I lived here. I bet I was down here every week or every other week, taking a run along the boardwalk and eating lunch somewhere nearby. I sat upstairs in a restaurant, doing a little work for my presentations tomorrow with lunch. 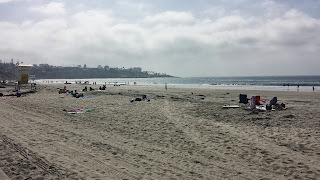 Afterwards I drove up to La Jolla. I was thinking to swim at a pool up there, but I must have driven past it. And I was full. I parked at the Cove, walking a little and reading a few things from work by the beach for 30 minutes. 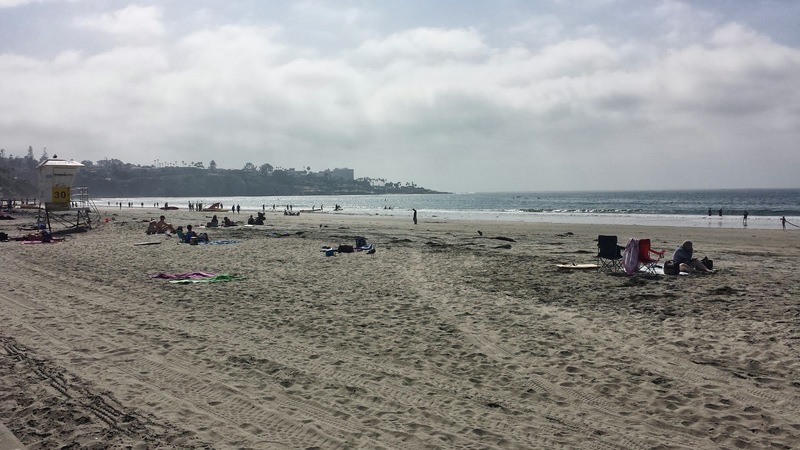 I debated with myself about hitting a yoga class, the hotel gym, or the beach. I decided to try the beach. I swam in the Cove (and ocean) when I lived here, but always thought it was really cold. I didn't have a lot of hope today, but since I'd walked through some waves, I thought I could handle it. No towel, I changed in the car and walked out to the beach. I dropped my shirt and keys and headed into the water. Chilly, but not that bad. I got past the breakers and put on goggles before starting to swim. I could see pretty well to the bottom, which was only about 5 feet down. I swam for a couple minutes and then was startled by a large fish. Not sure what it was, but below me in the shallows, a 3-4ft long fish of some sort. Brownish, somewhat tiger striped. I felt good, working a bit, but not too hard, but about 5-6 minutes in, I hit a patch of seaweed. On my face as I tried to breathe, hanging on my ear, not pleasant. I swam through it and thought I'd avoid it on the way back. A couple minutes later and I was in more of it, a big patch this time. Not sure what was going on as it was floating, but it was incredibly annoying and distracting. So much for my swim. I headed in and was near the end of the swim beach area anyway. Breathing hard, I headed North, walking. I had a good, almost mile walk up to the pier and then back to the car. The weather was great, people playing volleyball, amazing houses in the cove. I remember what I enjoyed about CA. I also remembered the chafing each spring as I wasn't used to walking in trunks. I had some chaffed spots by the time I got to the car. A short drive up the 1, enjoying the view of UCSD, Scripps, and Torrey Pines. 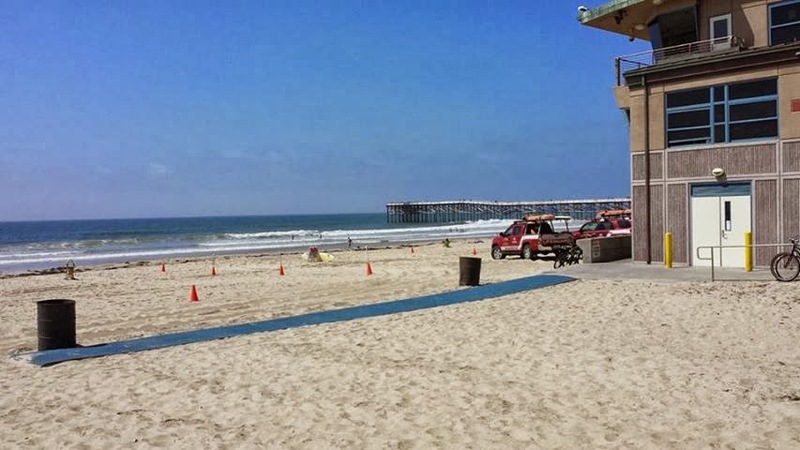 I checked into the hotel in Del Mar, did a short workout (walking, since I didn't feel like I'd worked) and spent time going over a presentation. Then it was dinner time. With the NFL on tonight, I headed into Del Mar, to the Plaza across from the beach. I used to work there, and was thinking to visit Epazote, the place I worked. It's been a long time, and while the other well known places were there, Epazote was closed. It's in the process of renovation, so I walked across the plaza to Pacifica, the seafood bar/restaurant I visited a few times. Parking at the bar, I had a few drinks and a nice dinner, watching football and reminiscing. The last time I was in that place, or one of the last times, was 21 years ago. Patrick Ewing and Charles Barkley were sitting at the bar as their summer was spent training for the 92 Olympics in San Diego. The bartenders were probably in diapers, or elementary school at the outside. I felt old, but I was at peace and enjoyed it. Good to be back in CA. Now to sleep and then get up and find the pool in the am before work. Today was Kendall's 3rd home game. We went and watched them struggle in the first game. So many girls, including Kendall, couldn't serve. It was a mess of a game and they lost. In the second game, things weren't better for awhile. Down 19-15, Kendall came up and got them to 20-19 before she missed a serve. Then they played well to win and force a third game. In that one, they made some mistakes, but the other team fell apart. At one point Kendall made 2 or 3 mistakes in a short time and the coach pulled her. She had played all of the minutes to that point. 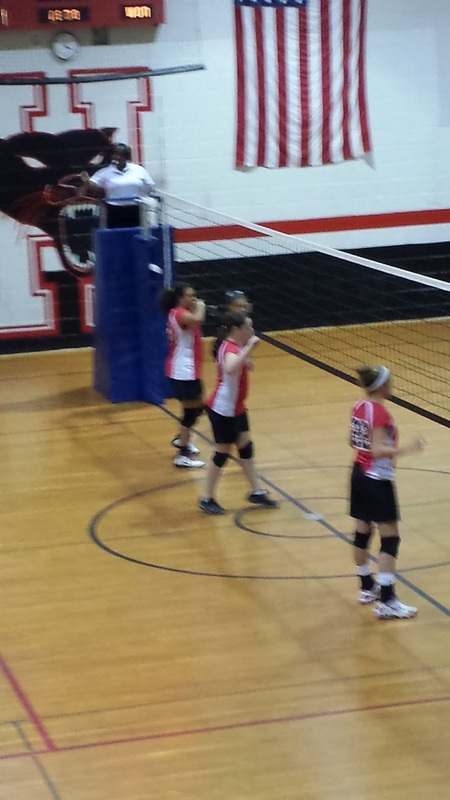 After a point on the bench, she came back in to serve and get the team way up. All in all not great volleyball, but they won. Since the first week when they lost the first 2 matches, they haven't lost. 4-2 this season. Delaney woke up, showered, ate, and got on the bus. An hour later I had a call from school that he wasn’t looking good. I went to get him and he said his stomach hurt and he had a headache. We made it 2/3 of the way home before he had my pull over so he could throw up. A great night in Winter Park on Friday. Despite a lot of chaos in our lives, things worked out and Tia and I had a nice time away from life for a night. We have been trying to get away as a couple since June. Tia’s injury delayed things, but we decided that we needed to get away and not delay and more. With Tia gone early last week and her clinic cancelled for the weekend, I just booked a night Friday in the mountains. We had a lot to take care of to get out there and plans were changing until Friday morning, but it worked out. Delaney was supposed to be above Boulder in the mountains for the Boy Scout COPE program for the weekend. I had planned to get him and a friend up there Friday, and then drive to Black Hawk with Tia. However the rains in CO cancelled his weekend, despite me meeting up with the other kid’s Dad, packing, etc. Fortunately Kyle could pick him up at school after Friday’s track meet. Kendall had volleyball, but Kyle also agreed to pick her up, and when she got a birthday invite to Friday night in Parker, he handled that. A driving night for Kyle, out to Elizabeth, then to Parker, then back to Elizabeth and home. Black Hawk was out with expensive hotels and not much choice, so I booked Winter Park. Worse case, we have dinner and a night in a hotel with nothing else to do. That ended up as our night after I rolled my ankle Thur night at volleyball. However it was great. We checked in, wandered to a new bar for a drink and ended up eating appetizers for dinner, sitting there chatting and enjoying the night. Breakfast the next morning together, massages in the afternoon and we were home for dinner and dominoes with the kids. I planned on getting a few more pictures, and maybe some video of the game. As I left the house, it started to rain, so I didn’t bring the video camera, and I was glad. I got set up at the top of the bleachers, was reading a little for work when Kendall ran up during warmups and asked if I could do lines. Apparently one of the parents had signed up and didn’t come. So I did lines. Only one call for me, but since I was on the court, I did get one good picture of Kendall after a timeout. The first game was uneventful. Kendall played, had 3 or 4 good serves, and a few good plays at the net. Her team killed the opponent, something like 25-11. Kendall played the second game as well, but with 4 of the subs and they struggled. Lots of missed serves, girls not moving to get balls and they were down 22-14 at one point. I thought there might be a third game, but the coach put a couple of the first stringers in the game and they came back to tie at 24. A couple back and forths before they won at 27-25. A good game, and I’m sorry I can’t see her play Wed, but they’re back down in Canon City. I don’t have a core list of things I want to teach my daughter, but perhaps I should. I saw this one from Arian Foster, running back for the Houston Texans. It’s 6 Things I’ll Try to Teach My Daughter, and it’s a good start. I wasn’t sure how Yoga would go last night, but it’s been 2 or 3 weeks and I wanted to get back. With kids fed and back home, work done, I watched 10 minutes of the PHI/WAS game before heading to yoga. Overall, I was. There were a few things I couldn’t do, pigeon, some of the chair poses I had to modify, but overall I got through class, including a couple nice, 15s Crow poses. It wasn’t hard, but it was a good workout, a good sweat, and good peace of mind. Now I need to get swimming today or tomorrow. The last baseball game of the season for my team was yesterday. It was the first playoff game, and we didn’t expect to do well, but we ended up having a nice game for 6 innings. We were in the lead, then had a tie before we fell apart a bit in the 6th or 7th. Some good hits, a few mistakes, and all of a sudden we were down a bunch. In the bottom of the 8th, we actually fell apart, let them get up by 10 and the game ended on a walk off single liner to left. I had a decent game. Not at the plate. I popped up three times, getting under pitches and sending them up. However I caught on inside and fouled it over the right field fence. I haven’t had a good hard hit from the left side all year, only batting a couple games at the beginning of the season and then the last two weeks. Felt good to get ahold of one. In the field I was at 2nd most of the game, then an inning at 3rd and the last one at short. At second I picked up two grounders in the first inning. The grass was tall and I had to charge them. Both were good throws, but the first guy was called safe. No one thought he was other than the umpire, but them’s the breaks. I got one bouncer thrown on a steal to second that I knocked down. Late I had the shortstop throw one low after he bobbled it and it was too low for the glove. It caught me in the hand and bruised a few fingers. Still sore today, but not too bad. At third, I had a great inning. A pop up just on the foul line I caught. Then sitting on a bunt on the grass, I caught a short lined in the air and almost doubled the guy at first. I ended the inning by picking up a slow roller in the grass bare handed and throwing the guy out. At short, not a great game. Missed a blooper that dropped just below my glove to the right. I was deep and the ball dropped quickly. Then on a grounder with the bases loaded, I picked it up and threw the guy out at home, but it wasn’t a great throw and we didn’t get the double. A good end, but without a doubt my knee is jacked up. Struggled to run and took to cheating a bit in one direction or the other. I need to get it checked out, and will schedule something here in the next few weeks. I’ve been a Lincoln Rhyme fan for a long time and watched part of The Bone Collector recently again. I need to re-read it since I can’t remember the details of that exciting book. The Kill Room is the latest in the series, and it seems to take a different turn. It felt much different to me, and I struggled with the first half of the book before it seemed to take off. In this one Rhyme is preparing for major surgery that might give him use of an arm, but he’s called in to consult on a case by a NY State DA. One that takes on a federal agency, which ordered the assassination of a US citizen in the Bahamas. From the beginning, we see some of what one of the assassin’s sees and while those parts are interesting, the parts with Sachs and Rhyme aren’t. There isn’t much physical evidence, not much of the deduction and reasoning that I love in the books. It’s more a story, and a somewhat slow one at that. Eventually it picks up and it’s got lots of twists and turns, but I have to say the beginning wasn’t great for me. Last night was the opening of the 2013 NFL season, with the Broncos opening at home. I was ready to watch the game, but only part of it. I really wanted to play volleyball. It’s been two weeks, including watching Kendall play her first home game of the season at school. She only played in the second game, but they won. In fact, the won both games, their first wins of the season. Afterwards she wanted to hang with friends, so I watched the 8th graders play. They’re better, and it makes me wish I’d played more as a kid. Kendall did well, some good serves, moving well in the switches to be one of the setters. She even got a good spike from the back row that scored. One of the few times her team scored, as opposed to (both sides) points being given for simple mistakes from players. I had planned on watching the game, but we were late getting back from the store and I was cooking steak and corn on the grill. With the TV upstairs, I thought I’d get to watch the Broncos on the Sunday Ticket promotion I got from EA Sports by buying their $60 game (instead of $60/mo for the subscription). However this was an in-market game. No Sunday Ticket. I quickly started recording the game, and tried to hurry dinner. A downer, since there was a 40 min lightning delay, so I needn’t have hurried. As I got upstairs at 6:55, the game still hadn’t started. When it did, the first couple series had Denver looking good. Exciting. Only to drop as Baltimore scored first, and then in the first half, looked better. Denver stayed with them, but it looked like BAL was the better team. Downer. Things changed when Jones (BAL) got hurt by his own player. Denver picked up the pace and I saw them score some quick TDs. It was 9:20 and 28-17 Denver. Surely, I thought, people will be packing up to play volleyball now that the game is going Denver’s way. I drove down to the church, but no one was there. No games. Sad face. I could have come home and walked, but I was feeling a bit down, and the Broncos game was over at that point. 42-17 and the day was ending on a sad note. Tia was tired, and I wasn’t sure what to do. I decided to read a bit. Since it had been a downer, I grabbed the latest Lee Child/Jack Reacher novel on the Kindle. I try to avoid the $10-15 books these days since it would impact our budget at the rate I read, but in this case the price was down to $11 (from $15 when the last new one came out) and I wanted to treat myself. It was great. I got caught up in it and it had the mystery, intrigue and pacing of earlier books. I had to finally put it down around 11 to get some sleep. This was my morning, before hunkering down in front of a computer for writing, watching some video, and working on presentations. The vet was coming to look at Rain and Tia had to get going, so I had to walk out and get Rain to come with me. She wasn't the interested until I bribed her. Yesterday was a chore day. Or a building day. I slept in a bit, which was nice. However then I needed to get going. Tia headed out for a ride, and after helping her with chores, I got going on making the rest of my feeders. Well, not the rest, but 2 more and finishing the third. Three are out, and working good, so I wanted to get these done. In the hot sun (90F), I screwed pieces together, sanded down, and painted with the anti-cribbing paint. I managed to get them mostly done, except the trim on the two new ones. I painted them, and they needed to dry, but by 4, I was beat. Tia and I hit the store, and I relaxed by drinking a beer, making more pot stickers, and then getting enchiladas in the oven. Two pans of enchiladas, but only the little kids ate. I had snacked on pot stickers, and Tia had a bunch as well, so we weren’t that hungry. A long day, but a good one.